Before logging into the Syncplicity app on your iPhone or iPad with your EMC account, your device must be properly registered to our Mobile Device Management (MDM) server. Once registered, the device is provisioned with EMC specific profiles that allow you to access EMC email or network. If you are not sure that your device is registered, see if the device has the Worx Home app installed. Open the Apple App Store on your device and search for Worx Home. Tap the Free button to turn it to an Install button then tap Install. Enter your iTunes password when prompted. Once installation is complete, return to your main screen then tap the Worx Home app. When prompted, choose to allow or not allow push notifications. If you are not sure, choose to turn on push notifications to be notified of new emails. Push notifications can be turned off later. When prompted, enter mydevice.emc.com as shown below then tap Next. Enter your username and network password in the box. Your username is your Logon ID that you use to log into your PC. Read and accept the Terms & Conditions. Tap Install Company Profile. 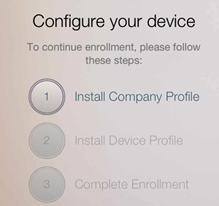 Follow the instructions to install the EMC Corporation CA certificate and tap Install in each screen to continue. If prompted for a passcode, enter the passcode you use to unlock your device. When the profile is installed, tap Done. Tap Install Device Profile. 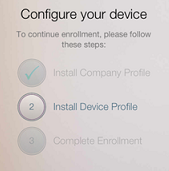 Follow the instructions to install the profile and tap Install in each screen to continue. If prompted for a passcode, enter the passcode you use to unlock your device. When the profile is installed, tap Done. You are re-directed to a Works Home screen. If you are prompted, tap Continue in the Passcode Requirement message then enter a passcode with five or more characters then confirm the passcode. Afterwards, tap Continue. If you previously had EMC Email on your device this step is not required and you will not see the popup. If you are prompted for a passcode then you are prompted for a password. In Password Required, enter your network password and tap OK to finalize connectivity to the EMC Exchange environment. NOTE: You may need to enter the password a few times before it is accepted. Enrollment is complete. It may take up to 10 to 15 minutes before the EMC Exchange email begins to populate your device’s inbox.